Here is a work in progress and a finish! I adore these two Lavender and Lace charts...the finished one is "Emma's Garden" and the work in progress is "Isabella's Garden". In the Emma's Garden project, instructions are given to actually work the lace on the project, but it is also suggested that you can add your own. 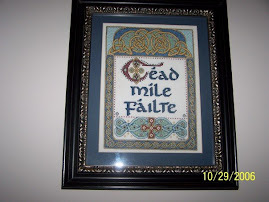 I chose to add a piece of a doily that my aunt made many years ago...when it is framed I will add this on the back, telling where the lace came from. I hope that each of my daughters will someday have these pieces hanging in their home and pass to their future children. For now, when both are done, they will hang in our family room. They are both so gorgeous! Great work!